The initiative taken by the government, to give jobs to individuals with special needs, at state institutions were supported by a total of 18 companies, offering jobs to individuals with hearing and visual impairments, physical disabilities and developmental disorders. Certificates of employment were awarded to all the individuals in the presence of the President of the Maldives, Mr. Yaamin Abdul Qayyoom, at a ceremony held at Dharubaaruge Rannabandeyri Maalam on 30 January 2017. Public Service Media is honored and proud to be one of the 18 state run companies to offer jobs. The initiative was taken to help the individuals to overcome the challenges they face and feel accepted by our society. Public Service Media offered job opportunities to 7 individuals with special needs. The newest addition to the PSM family, comprises of individuals who not only possess all the necessary attributes needed for their respective jobs but are also talented. Among them, are individuals who had taken part in the first franchised reality show, ‘Maldivian Idol’. 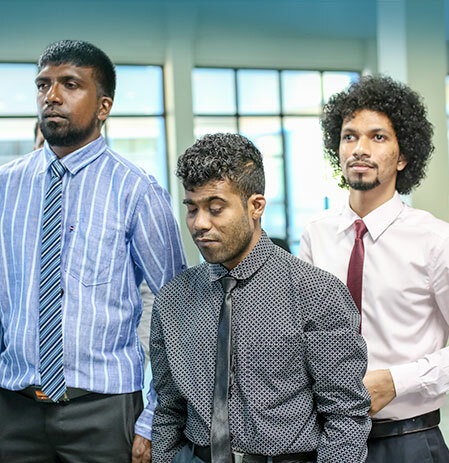 Ziyau, Maazin and Yamin, though visually impaired, are amazing presenters, who without a doubt would bring radio shows, that many audiences would regularly tune it to. With a beautiful voice, Zahwa auditioned for the first season of ‘Maldivian Idol’, and was also the female vocalist who performed at the ceremony held to award jobs to the individuals. The male vocalist was none other than our radio producer/presenter, Ziyau, who also was a contestant in ‘Maldivian Idol’ season 1. Though he may have not performed on any singing platforms yet, Imad also has a passion for singing, and is pretty good at it too. Not all of our differently abled employees have talents related to media and music industry. Shara is a remarkably good seamstress, who can recreate the clothing worn by any celebrity or model, whereas Ameen has a unique personality with a warm smile and a beautiful mind. Public Service Media believes that the employees, though differently abled, would contribute much to the success of the company and add value to the organization.